The size of the all new Canon XC10lends the camera to run-and-gun applications, such as documentary and many types of event shooting, where the larger form factor of an interchangeable lens cinema camera or DSLR might prove impractical. Another obvious use case for high performance in a small body is mounting on a medium-sized UAV such as a hexa-rotor. The camera features a hot shoe that supports Canon speed lights or works as a standard cold shoe for LEDs, microphones, or other third-party on-camera accessories. 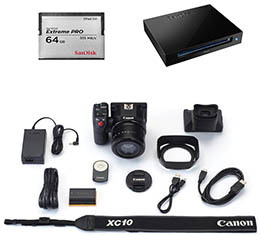 Still photos, user settings, and video up to and including 1080p are recorded to SDHC/SDXC memory cards. To handle the up to 305 Mbps bitrate of 4K video there is also a CFast card slot. Enjoy a range of high quality creative shooting options with Canon's highly versatile XF-AVC H.264 codec. Shoot stunning 4k video at up to 305Mbps/4:2:2/8 bit, for easy integration into existing 4K workflows or capture high quality, long duration Full HD movies at 50Mbps/4:2:2/8-bit. Capture beautiful high resolution 12 Megapixel still images with ease and decide how they will appear and be recorded by selecting one of a variety of different 'look' settings and adjustment functions. You can also extract and save the best frames from a 4K movie by frame grabbing 8.29 Megapixel stills.